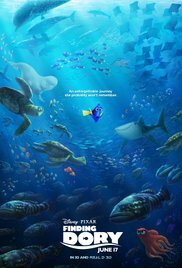 Plot: The friendly but forgetful blue tang fish, Dory, begins a search for her long-lost parents, and everyone learns a few things about the real meaning of family along the way. Starring: Ellen DeGeneres, Albert Brooks, Ed ONeill, Kaitlin Olson. distributed by Buena Vista «Finding Dory» in the US movie theaters released on June 17, 2016 and has grossed over $1 billion worldwide; dvd and blu-ray release date was set for November 15, 2016. Rent from Netflix and Redbox from November 15, 2016. «Finding Dory» in the UK released in movie theaters on July 29, 2016. The movie released on dvd and blu-ray on November 28, 2016.